The weather was very blustery today - definitely not the sort to be out on the water in a 14 foot boat. However, that is hypothetical, because I am still preparing ‘Sandpiper’ for her first outing with me. Only if there is a bit of wind will I discover what works and what does not. By the end of the morning I came up with a temporary solution for where to put the drinking water so that I can conveniently help myself, perhaps for making a cup of tea or for cooking a meal. I already own a plastic keg with a pushbutton dispenser; therefore rather than buy a new container, I put my creative thinking hat on. The resulting system for dispensing water does not look pretty, but it works. 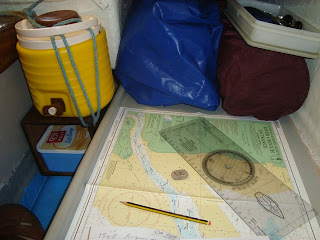 The other thing requiring attention was where to place a chart for a spot of traditional navigation. The answer was staring me in the face in the form of my bunk top without the mattress. In fact, when the chart is there I can see it from the cockpit.